Never tried butternut squash? Our recipe for Creamy Squash Soup will win you over. Place squash and carrots in large pot. Add broth and water; stir. Bring to boil over medium-high heat; cover. Reduce heat to medium-low; simmer 10 minutes or until vegetables are tender. Cool slightly. PUREÉ in blender in small batches; covered. Return to pot; keep warm on low heat. Stir IN pepper and nutmeg. Remove from heat. 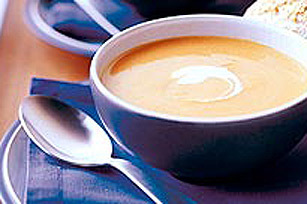 Add a few tablespoonfuls of hot soup to sour cream in a small bowl; mix well. Stir into hot soup. Top with additional sour cream if desired. Substitute ground cinnamon, dried tarragon leaves or curry powder for the nutmeg. Butternut squash should have a hard tough rind and be relatively heavy. Reserve 1 Tbsp. of the sour cream; mix with 1 Tbsp. skim milk. Swirl into hot soup as a garnish just before serving. Serving Size Makes 6 servings.